Columbus, Ga, 5¢ blue provisional entire #19XU1, no town cancel as frequently the case, but addressed and no doubt delivered to John A. Cobb, Esq., Athens, Ga, to whom it is addressed. Reduced at right with restoration strip at right just into the address. ONLY 27 RECORDED in the Crown surveys. SCV $1,200. $600. John Addison Cobb, Jr. (1783-1885) was the father of Georgia Governor and Confederate Major General Howell Cobb, as well as Confederate Brig. Gen. Thomas Reade Rootes Cobb who is crediting with writing the Confederate Constitution. 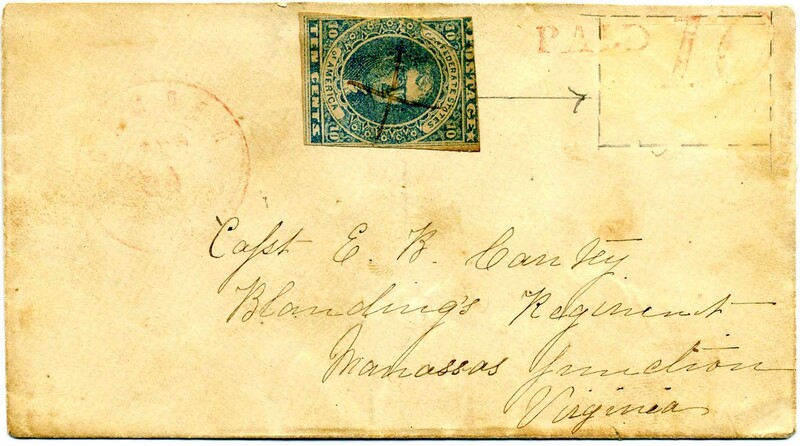 Galveston, Tex 10¢ black provisional entire #98XU3 used with matching town postmark, to J. Ed. Wallis Esq, Chappell Hill, Texas with soldier endorsement of “J. C. W. Augt 26 / 64, Pollard Brigade,” part of back flap missing. ONLY 2 RECORDED in the Crown surveys. SCV $2,750. $1,300. Joseph Edmund Wallace (1835-1907) was from Chappell Hill, Texas. More info on linked page. 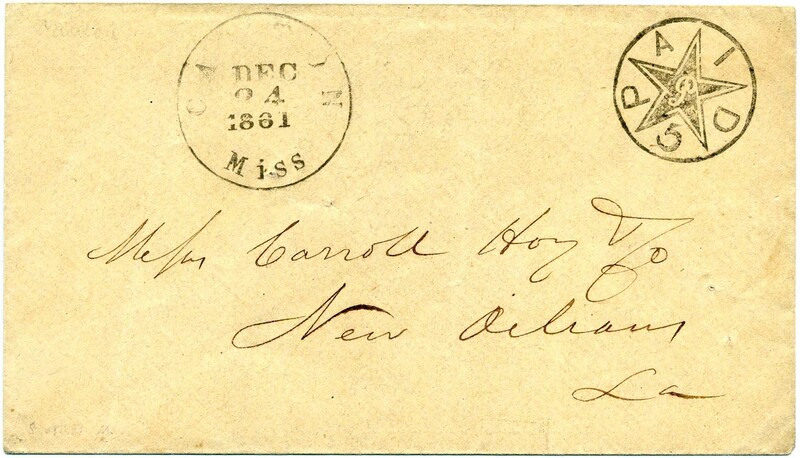 Jackson, Miss 5¢ black provisional entire #43XU1 used with Mar 6  town cancel, to Messrs Carroll Hoy & Co, New Orleans. Pink lined envelope slightly reduced at top with small restored pieces across the top. 34 RECORDED in the Crown surveys. Nice strikes, SCV $750. $300. New Orleans, La. 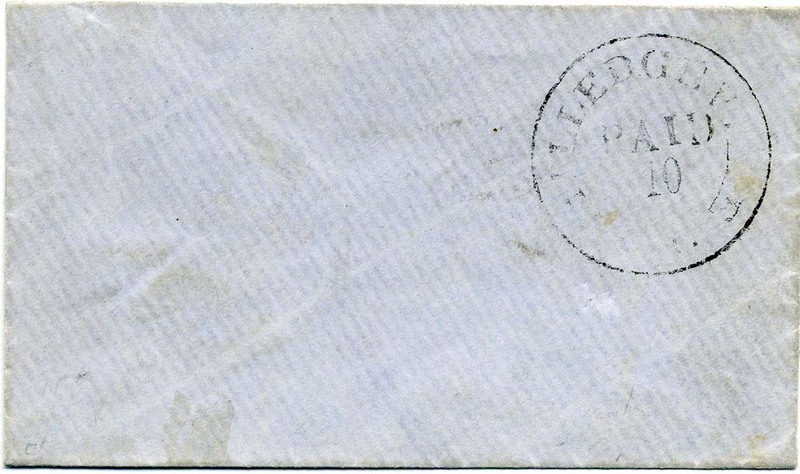 5¢ brown #62X3 tied by usual blurry bold town cancel (canceling device deteriorated with time) on cover to Jas. Elliott, Orchard Green, La. Bit of soiling and edge wear. SCV $450. $350. Uniontown, Ala, 5¢ green on gray blue #86X3 tied to small pink-lined cover by 10 Mar town cancel, to Porter King, Marion, Ala. 1984 CSA certificate mis-characterized as “genuine stamp with large tear on repaired envelope.” The stamp does not have a tear. The entire right side of the cover and stamp have been restored, including a masterful job of creating a matching right side of the stamp with virtually perfect ink match. ONLY 9 RECORDED in Crown by Hart and Phillips. Ex Hessel. SCV $15,000. $6,500. Charleston S.C., 5¢ Blue #16X1 with 4 margins, tied by clear strike of. 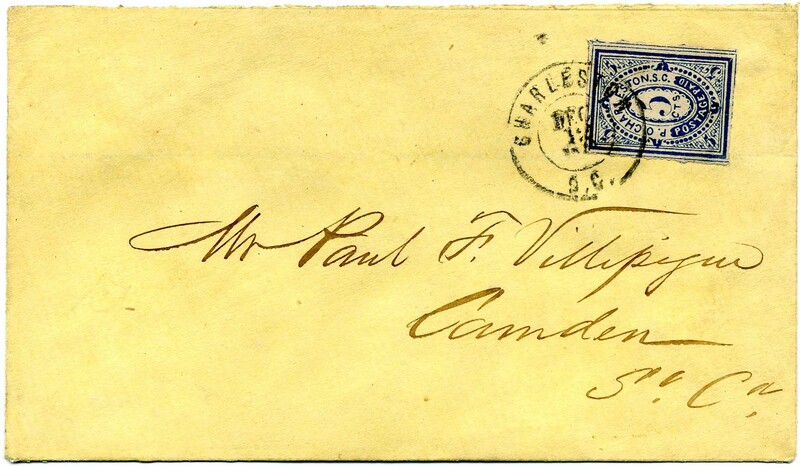 Dec. 12, 1861 town double-circle datestamp on cover to Paul F. Villepigue, Camden S.C.; faint horizontal file fold just below the stamp, cover lightly cleaned, Very Fine appearance, an attractive cover. Will be the topic of one of my columns. Ex Powell. SCV $2,500. $1,500. Paul Francois Villepigue was born in St. Domingue, Haiti, in 1797 where his father was killed by his slaves in a slave rebellion in 1800 during the Haitian Revolution. Much more info on linked page. 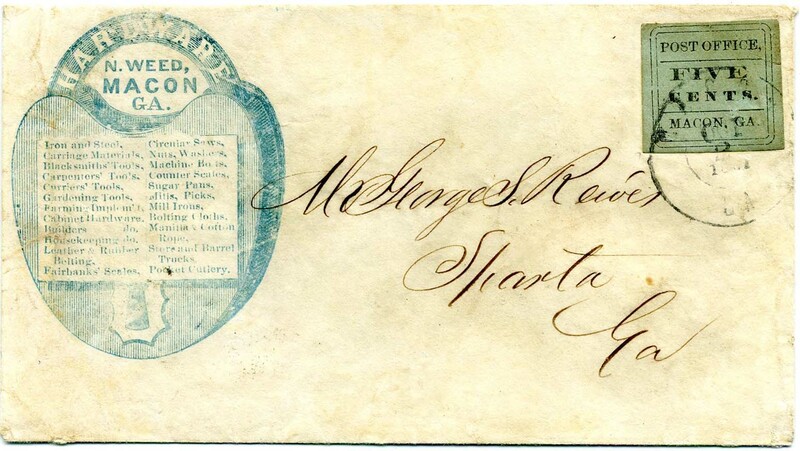 Charleston S.C., 5¢ blue #16X1, large margins to in where separated a bit roughly, uncanceled, neat strike of November 24, 1861, double-circle town cancel on ad cover to B. F. Brown, Esq, Anderson S.C., with J. N. Robson Commission Merchant's oval corner card, stamp with some toning, cover expertly repaired at top, otherwise Fine, perhaps 14 such are recorded in the Calhoun census and several are embossed and difficult to see clearly. Ex Calhoun with his owner backstamp. $500. J.N. Robson & Son was established in 1839; Robson was a pioneer in introducing Western trade into Charleston. Much more information online from various sources. 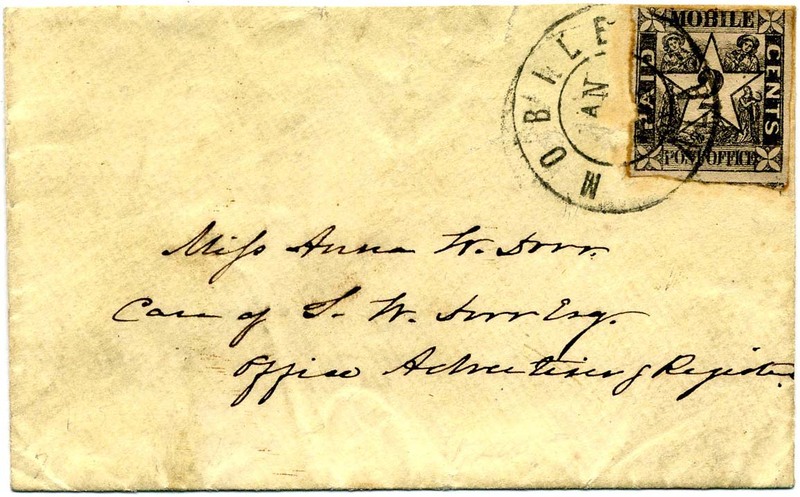 Mobile, Ala. 2¢ black #58X1 tied neat [J]an Mobile town double circle datestamp on tiny local cover to Miss Anna W. Dorr, Care of S. W. Dorr Esq, Office [Mobile] Advertiser & Register. ONLY 23 RECORDED in the Crown combined surveys. 2016 CSA Certificate stating that stamp has nick at left center and top margin cuts into design; envelope reduced slightly at top and most of top back flap missing. SCV $6,000. $5,000. 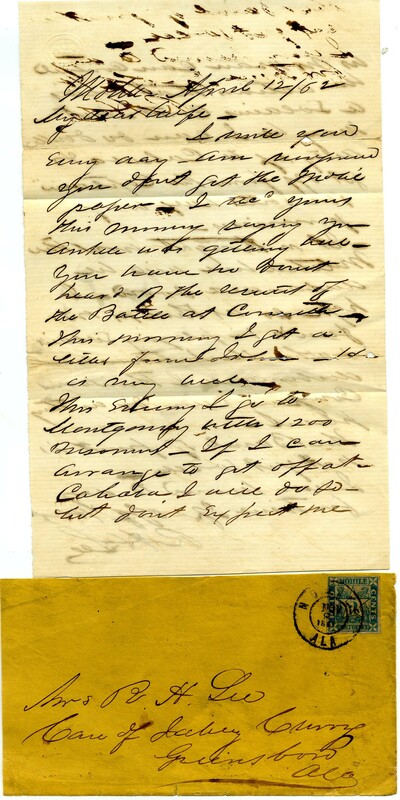 Mobile, Ala 5¢ blue postmaster provisional #58X2, superb 4-margin copy tied neat Mobile Sept 22, 1861, double circle datestamp on darling small fancy laid paper envelope to Miss Cecilia Labadie, Galveston, Texas, with fabulous 6-page (4 pages plus 2 cross-written) original letter (extensive file splits that have been repaired with acid-free archival document tape) from a soldier, S. Badie, saying, in part, “We were somewhat alarmed that three nites ago after the federals bombarded Galveston…took possession of Ship Island. Our Confederates had Ship Island but the fire of the enemy was stronger than ours so we abandoned the Island & took our ammunitions & all our property...[a] great battle took place in Kentucky between 1800 Federals & 800 Confederates. Federals completely routed & Confederates Captured 400 stand of arms…on 19th in town of Barbourville in Eastern Kentucky…Captain Alden sent bomb shells in the City…here made by us Mobile at Foundry so we can defy those who enter our City. Old Abe has promised England & France to give them our Cotton but I am afraid he will look out & he will be…a hooter if he comes near this…” and on and on – excellent content. Lovely cover and letter, Ex Markovits. SCV $2,000. $2,750. Mary Cecelia Labadie was one of the 3 daughters of Physician, businessman, and San Jacinto veteran, Nicholas Descomps Labadie. Much more detailed information on this Texas man on the linked page. MACON GEO. 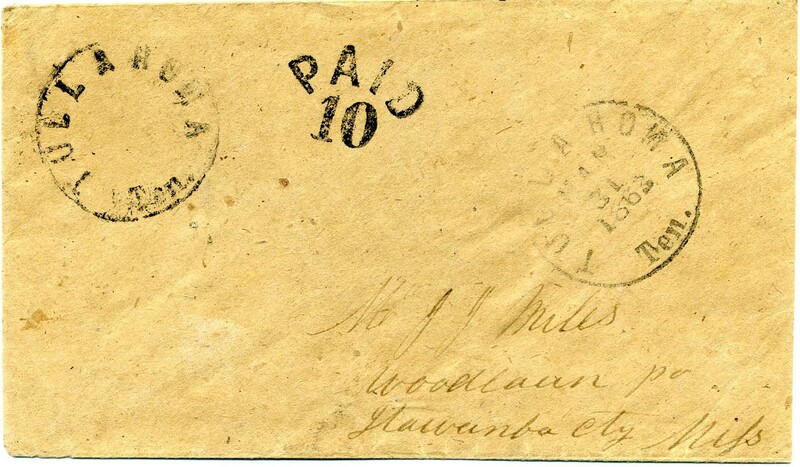 / PAID 5, 5¢ black provisional entire #53XU1 used with Macon, Ga. Nov 12  cds, addressed to Messrs McWilliams & Roberts, Griffin, Ga. Lightly cleaned. “Plantation Collection” SCV $650. CCV $750. $600. 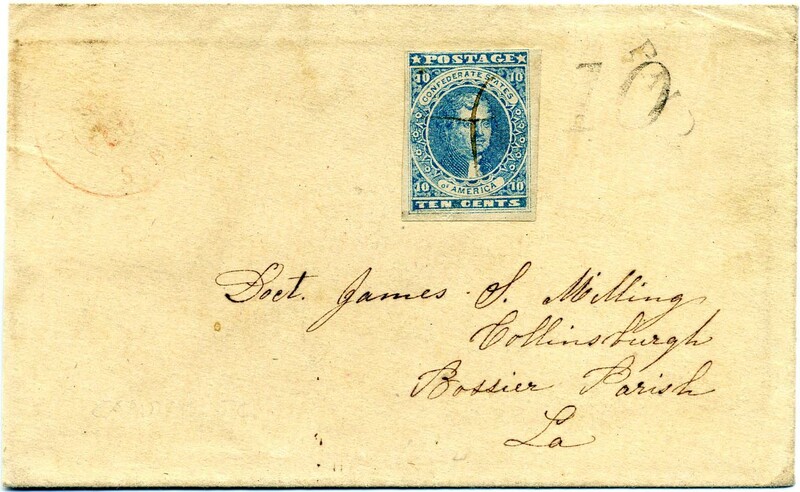 Mobile, Ala, 5¢ blue #58X2 (pre-use “scrunch up” at lower left) tied neat Mobile Aug 24, 1861 double circle cancel on cover to Gaius, Whitfield, Esqr., Demopolis, Ala. Docketing indicates “Jas R. Smith / Wants money” (Don’t they all?) “Plantation Collection” SCV $2,000. $750. Milledgeville, Ga., 10¢ black #57XU5, unused handstamped provisional on homemade blue laid paper envelope. SCV $125 and CCV $250, both of which I consider off the mark. Try to find unused provisionals of any kind. Rare. ONLY TWO UNUSED PROVISIONALS LISTED IN CROWN SURVEYS. “Plantation Collection” $400. 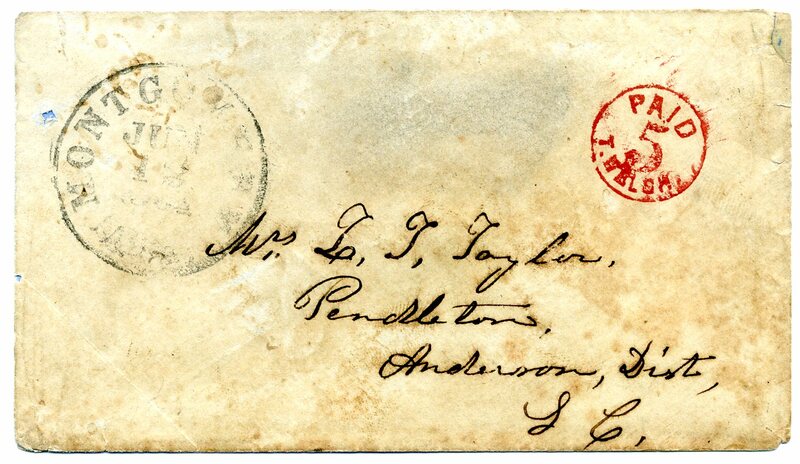 Charleston, S.C., 5¢ blue #16X1 with large margins to just in, tied by bold clear town postmark Oct. 1, 1861, on cover to W. R. Johnston, Petersburg, Va. missing part of back flap and small cover repair at top not near the stamp. SCV $2,500. $1,100. 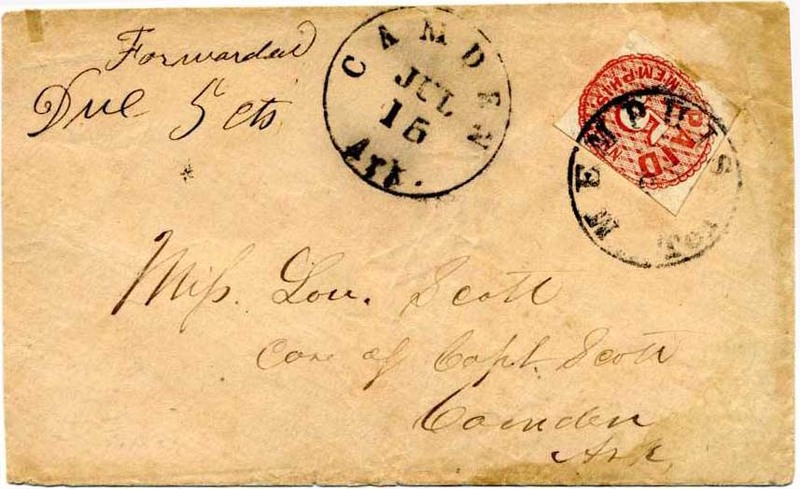 Knoxville, Tenn., 5¢ brick red #47X1 lightly cancelled by manuscript, as usual, on cover to L. M. Scott, Esq., Greensboro, Guilford County, N. Carolina, Fine, 2010 CSA certificate, Ex Pegram, SCV $2,100. $1,800. Macon, Ga., 5¢ black, Comma After "Office" #53X1, Type II, tied by MACON / GA double-circle datestamp on small cover to Mrs. Edward D[orr] Tracy, Huntsville Alabama, original letter enclosed, sister Hattie to sister Ellen, mentions knitting socks for the soldiers by candlelight, slightly reduced at top with top back flap removed, minor edge wear, lightly cleaned, Very Fine appearance. 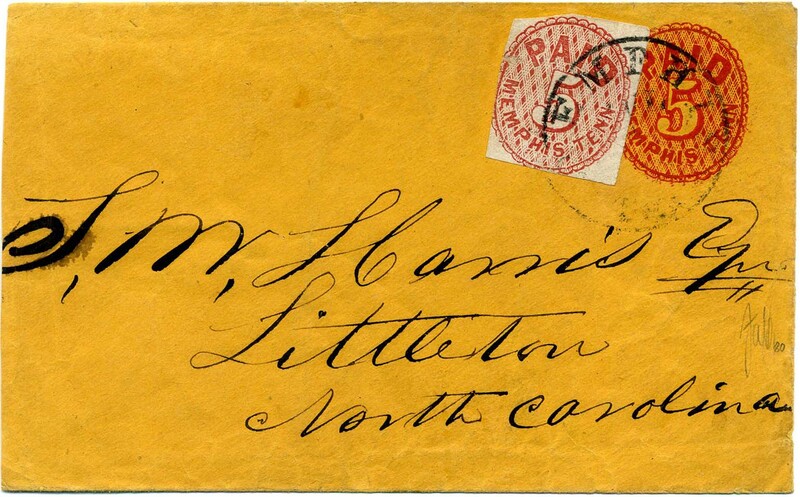 The Macon provisional with “Post Office, Macon, Ga.” added to the setting is rare on cover (Peter W. W. Powell reported 24 on cover in The Confederate Philatelist, Sep.-Oct. 2000). According to Powell, the Comma after "Office" variety is approximately twice as rare as the period variety, Ex Everett and Pegram, 2009 CSA Certificate, SCV $7,500. $5,750. General Edward Dorr Tracy led the 19th Alabama with great distinction at the battle of Shiloh. He was killed on May 1st, 1863, while leading his Alabama regiments at the battle of Port Gibson. 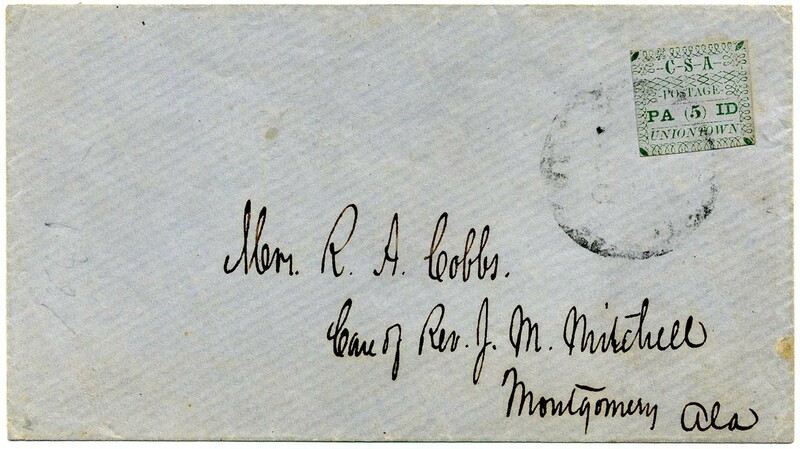 Mobile, Ala., 5¢ blue #58X2 tied by MOBILE / ALA // NOV / 8 / 1861 double-circle datestamp on cover to Mrs. R. H. Lee Care of Jabez Curry, Greensboro, Ala., letter enclosure matches handwriting but is from a different cover (based on date), slight stamp toning, cover slightly reduced at top and left, otherwise Very Fine. SCV $2,000. $1,100. Nashville, Tenn., 5¢ violet brown #61X5 with large margins all around, tied by blue Nov. 26, 1861, town circular datestamp on cover to Mrs. A. E. Bardwell, Macon Miss., care of Lucretius Gillespie, few sealed tears at top from opening, not affecting stamp or mentioned on accompanying 1991 CSA certificate. Ex Caspary and Agre. Worth professional restoration. SCV $4,250. $2,200. Memphis, Tenn, 5¢ entire #56XU3 overlapped by Memphis adhesive #56X2 (small sealed tear on either side), to make 10¢ rate, tied together by town postmark, boldly addressed to S. M. Harris, Esq, Littleton, NC, entire reduced at left. One of only a handful of covers recorded with this combination franking; only 3 Confederate post offices issued both adhesives and entires. 2016 PF Certificate, Stellar provenance of Ex Caspary, Matz, “Stonewall” and Haub. SCV $6,000. $5,000. 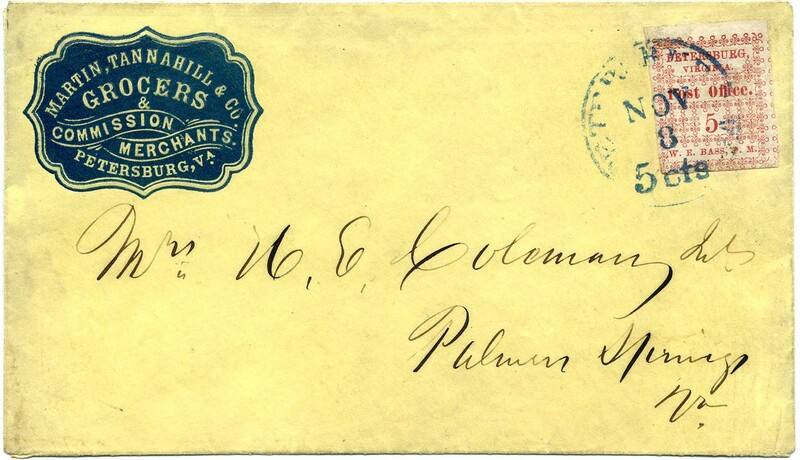 Petersburg, Va, 5¢ red #65X1 tied by blue Nov 8  5 cts town postmark on Martin, Tannabill & Co. Grocers & Commission Merchants blue cameo corner card, addressed to Mrs. H. E. Coleman, Palmer Springs, Va. Very Fine, 2002 CSA certificate, 2016 PF certificate. Ex Dr. Agre and Haub. SCV $2,500 without regard to showy cameo use. $3,000. Henry E. Coleman, Jr. served as adjutant of the 3rd Virginia Infantry. More detailed information on linked page. Nashville, Tenn., 5¢ violet brown #61X5 (small retouched scuff at UR corner) tied by blue town cancel on cover to Mrs. James M. Meek, New Market, E. Tenn, reduced slightly at ends and small corner repair. 2006 CSA Certificate #04815, SCV $4,250. $3,750. Warrenton, Ga., 10¢ manuscript over 5¢ handstamp, revalued entire #89XU1a, excellent strike on legal size envelope to Confederate Vice President A. H. Stephens, Richmond, Virginia, with neat matching February 17  cds, top back flap removed as usual for this correspondence with secretarial docketing on back, “Isaac B. Huff, Esqr, Warrenton, Georgia, Feb. 17th, 1862. Encloses a memorial of the citizens of Glasscock County praying the discharge of Dr. J. F. Usry formerly practicing physician in Glasscock. Dr. Usry is in Col. T. R.R. ‘Cobb’s Legion.” ONLY 11 RECORDED in the Crown survey, SCV $1,000, CCV $1,500. $850. Dr. Joshua F. Usry served in Capt. Stovall’s Company U, Cobb’s Legion, Georgia Cavalry, later transferred to Company A (Capt. T. Archer’s Company). Much more detailed information on linked page. 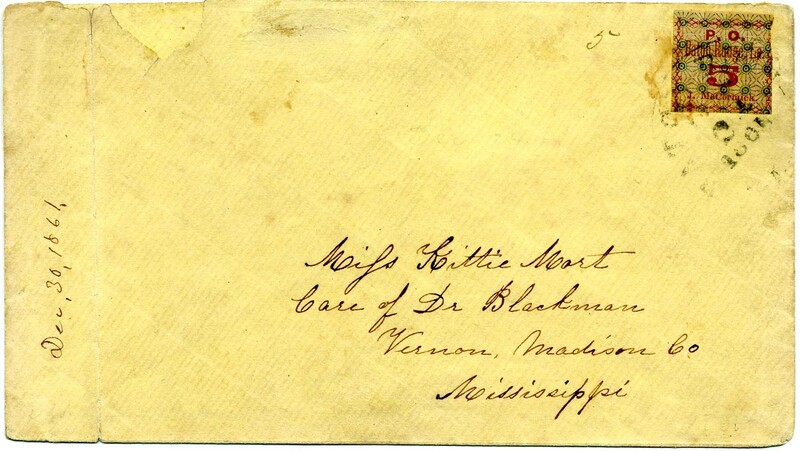 Baton Rouge, La., 5¢ green & carmine, Crisscross Border #11X3, slight gum stained, tied by light strike of December 24, 1861, town postmark on cover to Miss Kittie Mort, care of Dr. Blackman, Vernon, Madison Co, Mississippi, neat manuscript "5" at left of stamp, missing top back flap, small restored piece at top left, vertical file fold at left well away from stamp and address, ONLY ELEVEN COVERS WITH THE BATON ROUGE 5-CENT CRISS-CROSS BORDER STAMP ARE RECORDED. Both the Crown survey and the Calhoun census record only 11 covers with crisscross border stamps, all single frankings. 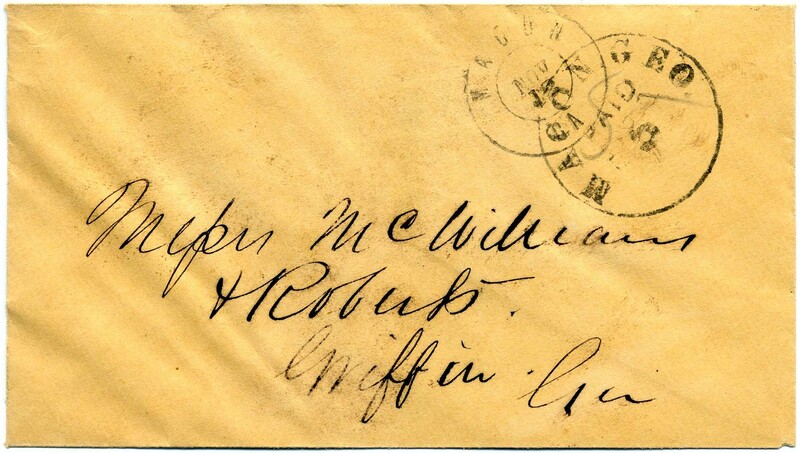 No covers are known with the "McCcrmick" error. Only two covers have four-margin stamps and almost all covers have minor faults or flaps removed. Ex Walcott. SCV $10,000. $5,000. 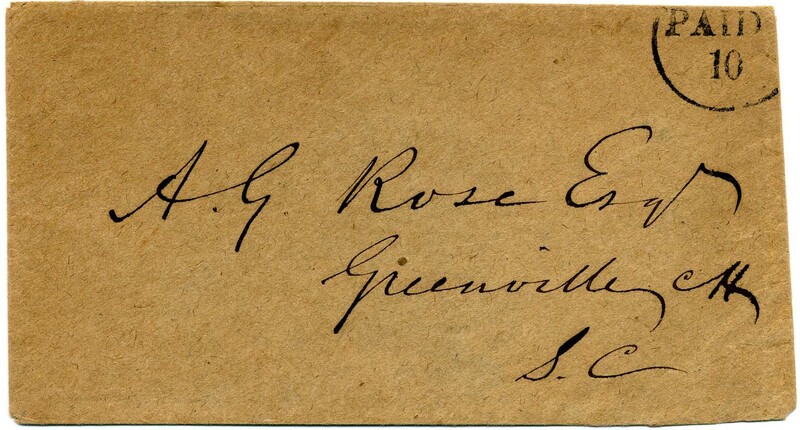 Camden, S.C., 10¢ black #125XU2, unused entire carried privately to A.G. Rose, Esq., Greenville C.H., S.C.; note on back indicates this originally contained an enclosure dated April 3, 1865, with 1977 C.S.A. certificate identifying this as a provisional, Dietz Type I, FOOTNOTE IN SCOTT REFERS TO THIS UNUSED EXAMPLE AS THE IDENTIFIABLE PROVISIONAL and states that when these are used (with postal markings) they are indistinguishable from stampless uses, ex Kohn. SCV $750. $750. 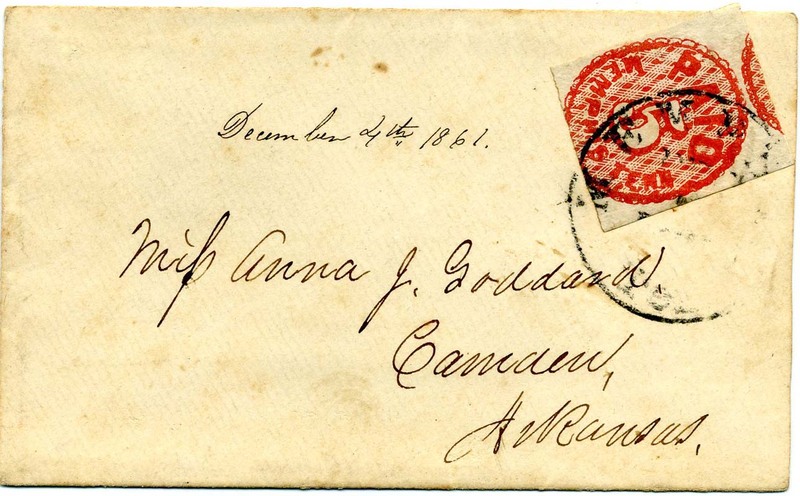 Camden, S.C., 10¢ black entire with PAID and 10 provisional markings (CSA Catalog CAM-SC-E03a) underneath 10¢ dark blue, Hoyer & Ludwig (2b), light pen cancel, faint strike of red Camden double-circle datestamp at left of cover to Dr. James S. Milling, Collingsburgh, La. ; stamp moved to left and hinged to reveal the provisional markings, Very Fine and scarce General Issue use on an obsolete provisional, with 1989 PSE certificate stating "genuine usage of 10 cent Confederate issue on unused, possibly provisionally prepared, Camden, SC 'Paid 10' envelope." 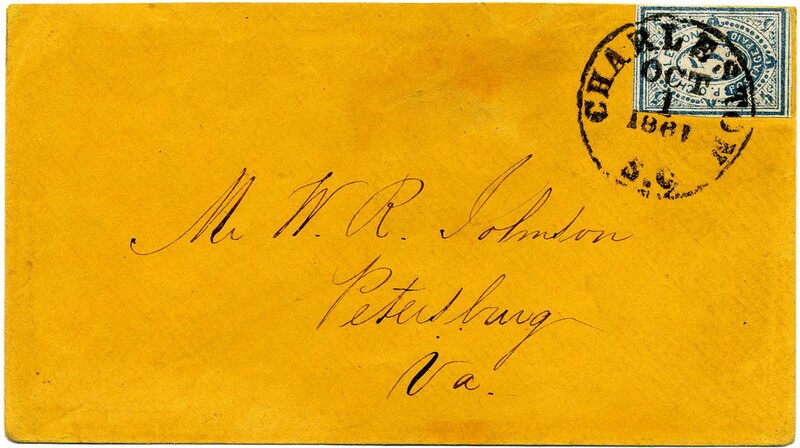 This variety of the Camden Postmaster's Provisional is unlisted in Scott (two+ years behind on updates), CSA Catalog value $1,500. $900. Camden, S.C., 10¢ red entire with PAID and 10 provisional markings (CSA Catalog CAM-SC-E03a variety) underneath 10¢ dark blue, Hoyer & Ludwig (2b), stamp defective, tied by pen manuscript cancel, faint strike of red Camden double-circle datestamp at left of cover to Capt. 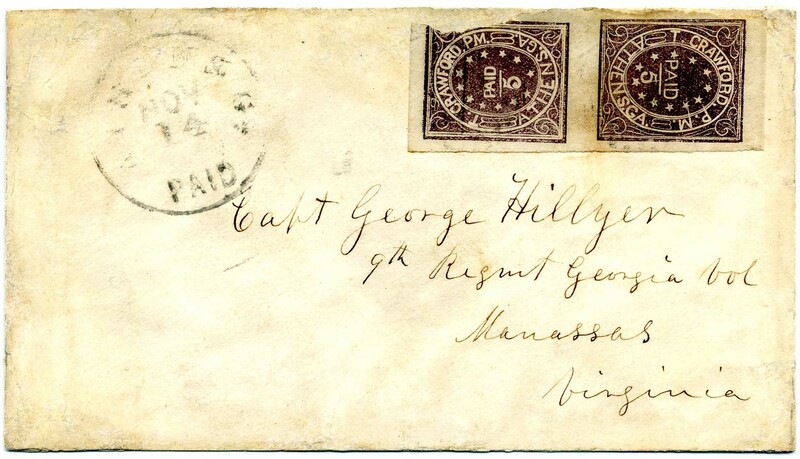 E. B. Cantey, Blandings Regiment, Manassas Junction Va. stamp moved to left and hinged to reveal the provisional markings, scarce General Issue use on an obsolete provisional, with 2000 PSE certificate as genuine usage including the comment "cover prepared as a provisional;" this variety of the Camden Postmaster's Provisional is unlisted in Scott (two+ years behind on updates), CSA Catalog value $1,500 as black. CSA Catalog lists it only in black, CV as black $1,500. $950. E.B. Cantey commanded Company C, 6th S.C. Infantry (Palmetto Sharpshooters), a part of the Army of Northern Virginia. More detailed information on linked page. 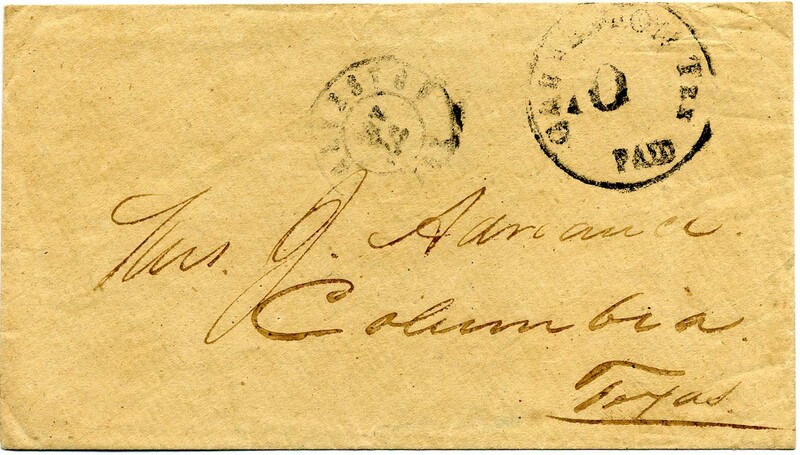 Canton Miss., 5¢ Black entire #14XU1, clear strike of “PAID / 5 / P” Star in Circle provisional handstamp, the "P" in center of the star is the initial of Postmaster William Priestly; light Jan. 17, 1862, cds on cover to Carroll Hoy & Co., New Orleans, usual filing pinholes this correspondence, late use. SCV $4,000. $2,250. 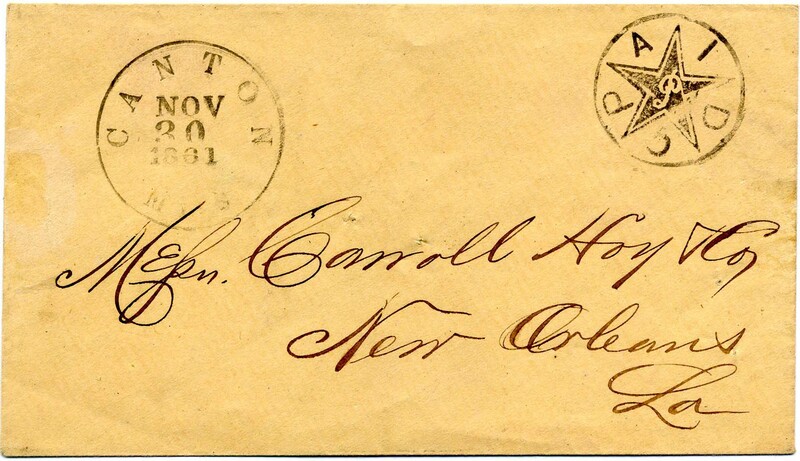 Canton Miss., 5¢ Black entire #14XU1, clear strike of “PAID / 5 / P” Star in Circle provisional handstamp, the "P" in center of the star is the initial of Postmaster William Priestly; light Dec. 24, 1861, cds on cover to Carroll Hoy & Co., New Orleans, usual filing pinholes for this correspondence, Very Fine. Ex Hall. Undated H.E. Harris certificate, SCV $4,000. $2,500. 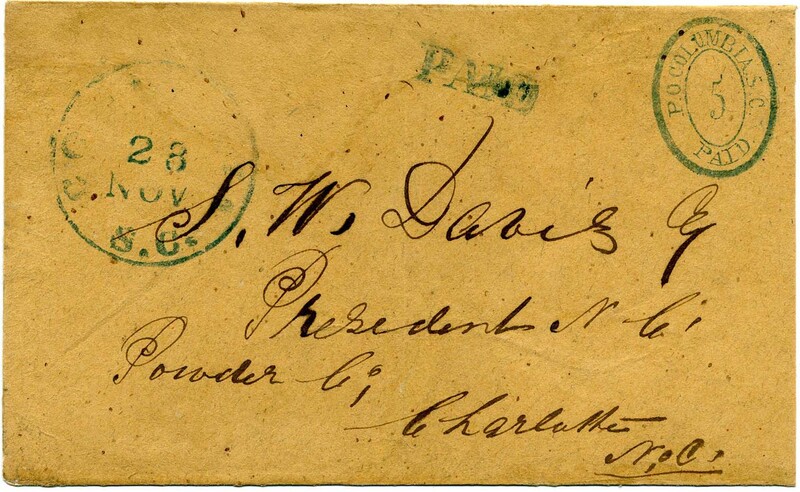 Columbia, S.C., 5¢ blue #18XU1, clear strike of provisional marking; 28 NOV  town postmark and PAID handstamp on entire to S. W. Davis, Esq, President, N.C. Powder Co., Charlotte, N.C., slightly reduced at right, Very Fine, SCV $900. $750. S.W. Davis was an attorney who established the North Carolina Power Manufacturing Company. More detailed information on linked page. Col. James Douglas Blanding served as Colonel of the 9th SC Infantry Regiment, Anderson’s Brigade, Longstreet’s Division, Department of Northern Virginia. Much more detailed information on linked page. Galveston, Tex., 10¢ black #98XU3, well struck provisional marking at top right, offset of provisional marking on verso—an indication of how they were prepared in advance; partly clear town postmark on entire to Mrs. J[ohn]. Adriance, Columbia, Texas; ONLY 2 ARE RECORDED IN CROWN SURVEY AND LESS THAN 10 ARE BELIEVED TO EXIST, ex Dr. Agre, with 2002 CSA certificate, SCV $2,750. $1,800. JOHN ADRIANCE (1818–1903) was an early Texas merchant and legislator. Much more detailed information on linked page. Greensboro, N.C., 10¢ red #32XU1 with very light strikes but readable markings on lightly cleaned soiled entire to John Glass, Pocotaligo S. Carolina 6th District N.C. Sen[ior] Reserv[es] Shobers Regiment In care of __. Faded handwriting has been enhanced and edge repairs. ONLY 8 RECORDED IN CROWN SURVEYS. SCV $1,250. $400. Macon, Georgia, 10¢ black #53XU1 on fresh entire to McWilliams & Roberts (a large mercantile firm), Griffin, Ga., used with light town postmark, 15 RECORDED IN CROWN SURVEYS, 1981 PF Certificate. Ex Andy Reis, SCV $500. $550. Memphis, Tenn., 5¢ red #56X2 pair, large margins to just in, showing part of adjacent stamps at left and bottom, tied by Oct. 2, 1861, town cds on cover to Mrs. M. A. Logan, Georgetown S.C.; slightly reduced at top and small repair at top right edge of cover, ONLY EIGHT PAIRS RECORDED ON COVER, ex Wm A. Fox and Alex Hall, 1993 CSA certificate. SCV $4,000. $3,000. 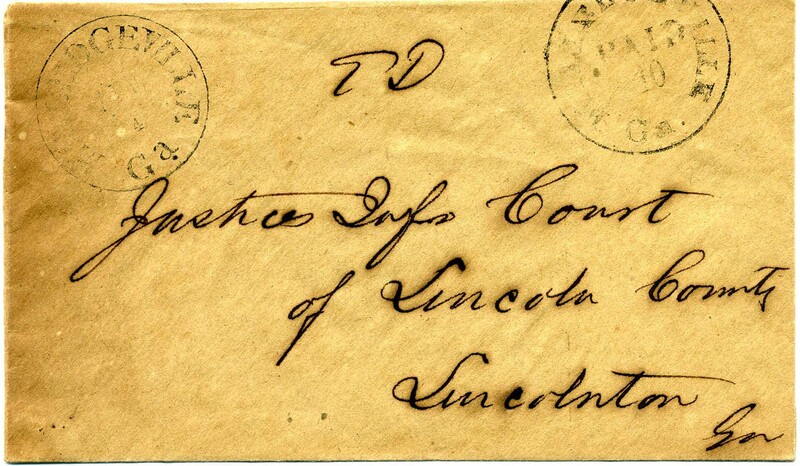 Milledgeville, Ga., 10¢ black #57XU5 used with Apr 4 town postmark, boldly addressed entire to Justices Infe[rior] Court of Lincoln County, Lincolnton, Ga. Very Fine, ONLY 5 USED PROVISIONALS LISTED IN CROWN Surveys of which this is the EARIEST RECORDED USE. SCV $800. $900. Milledgeville, Ga., 5¢ black #57XU1 used with Sep. 17  town postmark, entire addressed to miss S. R. Hawkins, Macon, Ga, Care G. B. Roberts, slightly reduced at top with two small sealed tears, one of which just touches provisional rim, fresh, 1985 PF Certificate, 21 listed in Crown surveys, SCV $500. $250. 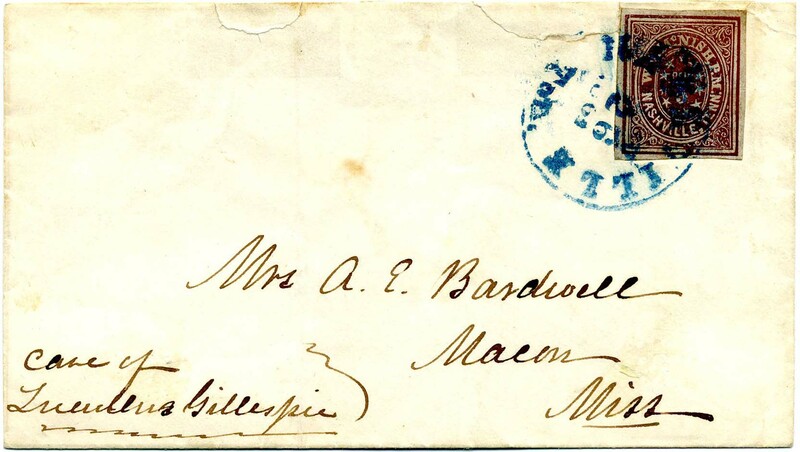 Mobile, Ala., 5¢ Blue #58X2, tied by Mobile Oct. 12  double-circle datestamp on cover to "Miss Lewis, Care of Maj. Gen. Jno. L. Lewis, New Orleans La. ", endorsed at left in same hand "Lieut. A.J. Lewis La. Infy", slightly reduced at left and light overall soiling. SCV $2,000. $950. Andrew J. Lewis served in Company E, 12th Louisiana Infantry. Much more detailed information on linked page. 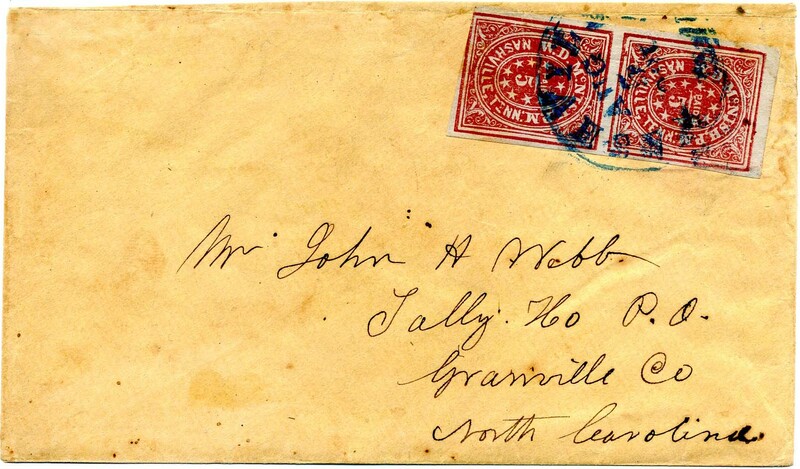 Montgomery, Ala., 5¢ red #59XU1 with bold strike of provisional marking on somewhat mottled blue-lined entire with black Jun 12 town cds, addressed to Mrs. L. T. Taylor, Pendleton, S.C.; tiny cover faults. 1983 PF Certificate, SCV $1,100. $550. 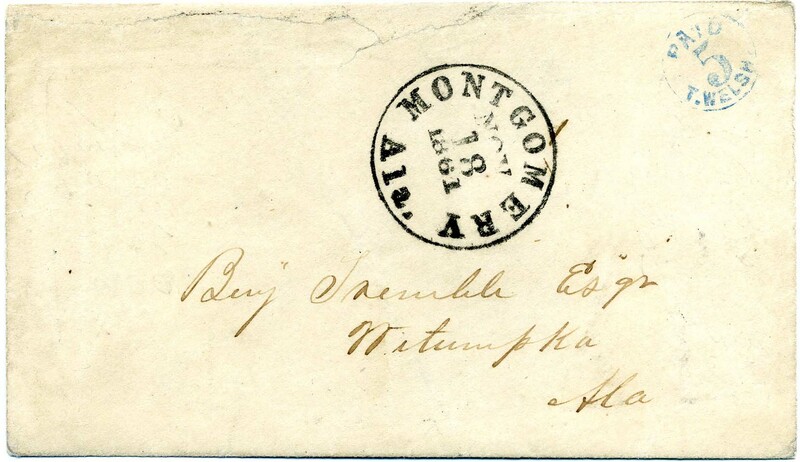 Montgomery, Ala., 5¢ blue #59XU2 with neat strike on provisional marking on entire with black Nov 18, 1861, town cds, addressed to Benj Tremble Esqr, Wetumpka, Ala.; professionally restored back flap and upper cover edge. SCV $1,000. $450. 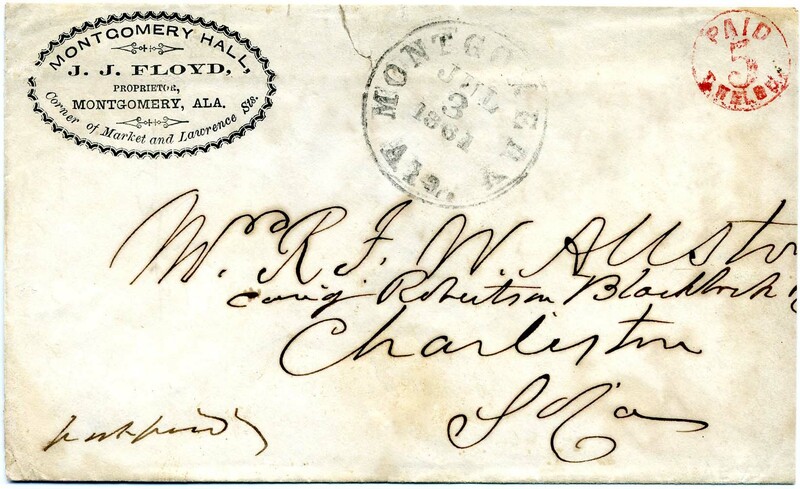 Montgomery, Ala., 5¢ red #59XU1 with nice strike of provisional marking on printed Montgomery Hall hotel corner card, black Montgomery Jul 3, 1861, cds, addressed to Mrs. R. F. W. Allston, Care of Robertson Blackstock, Charleston, So Ca. with “Post Paid” notation at lower left; slightly reduced at top and right with small sealed tear at top, accompanied by image of Montgomery Hall, an elegant hotel, J. J. Floyd, proprietor. SCV $1,100 without premium for corner card. $700. Robert Francis Withers Allston was a wealthy rice planter with over 13,000 acres of land and 590 slaves. Much more detailed information on linked page. 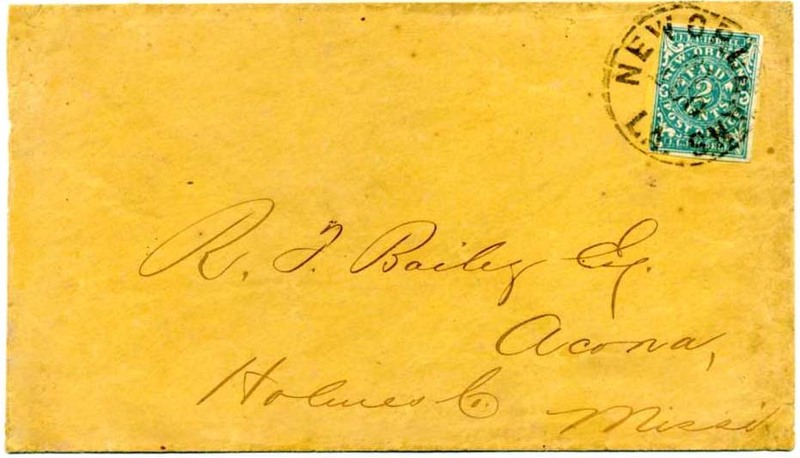 Montgomery, Ala., 10¢ red #59XU3 with bold strike of provisional marking on lemon entire with black June 25, 1861, town cds (sealed tear through cds), addressed to Dr. W. H. Gwathmey, Richmond, Virginia, reduced at left, ONLY 14 RECORDED IN CROWN SURVEYS, SCV $1,000. $500. 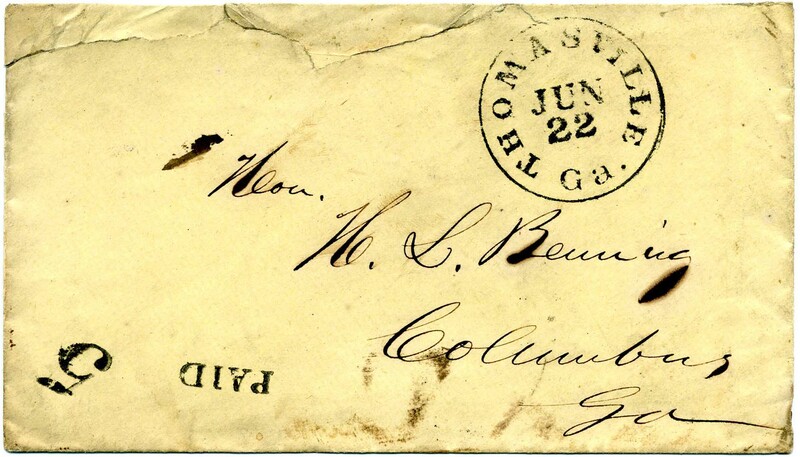 Thomasville, Ga., 5¢ black #82XU1 with bold Thomasville Jun 22  town postmark on entire to Hon. H. L. Benning (later Confederate brigadier general), Columbus, Ga., JUN / 1  FIRST DAY OF CONFEDERATE POSTAL SERVICE control on back flaps (this control date not listed in Scott which lists only 4 dated controls, this would be a 5th); 1996 CSA Certificate stating genuine June 1  control marking (control is necessarily before date of use). Opening tears across the top, worth professional restoration. ONLY 8 RECORDED IN CROWN SURVEYS. SCV $750 as regular use (not first day date). $1,000. Brigadier-General Henry Lewis Benning served as colonel of the 17th Georgia regiment. Much more detailed information on linked page. 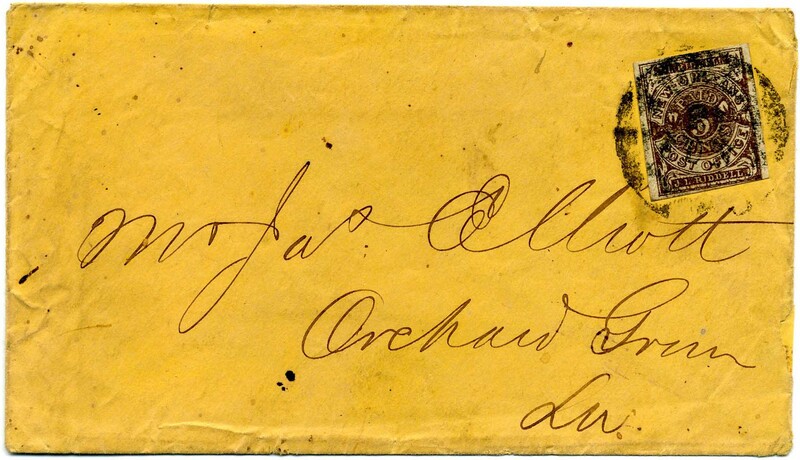 Tullahoma, Tenn., 10¢ black #111XU1, bold strike of provisional and control markings, Tullahoma Mar 31, 1863 cds on fresh entire to J. J. Miles, Woodlawn, Miss., 1988 CSA Certificate. ONLY TWO RECORDED IN CROWN CENSUS, although at least a few others are now known. Docketing on verso seems to indicate sender was Mary Miles. Miles served in Co. G, Miss. 35th Infantry. Rare! $6,000. $5,000. 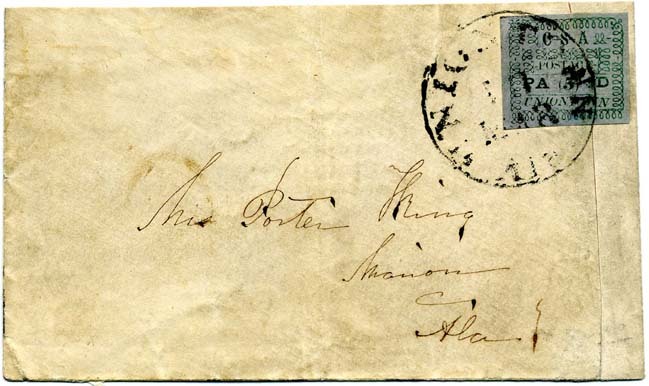 Charleston S.C., 5¢ Blue #16X1 tied by neat Charleston, S.C., Oct. 2, 1861, double circle datestamp on cover to Mrs. A. L. Hershman in Camden, So. Ca., with "Office of the Fire Alarm and Police Telegraph, Main Guard House, Charleston S.C." red imprint; left edge of cover restored as well as the stamp, Extremely Fine appearance. 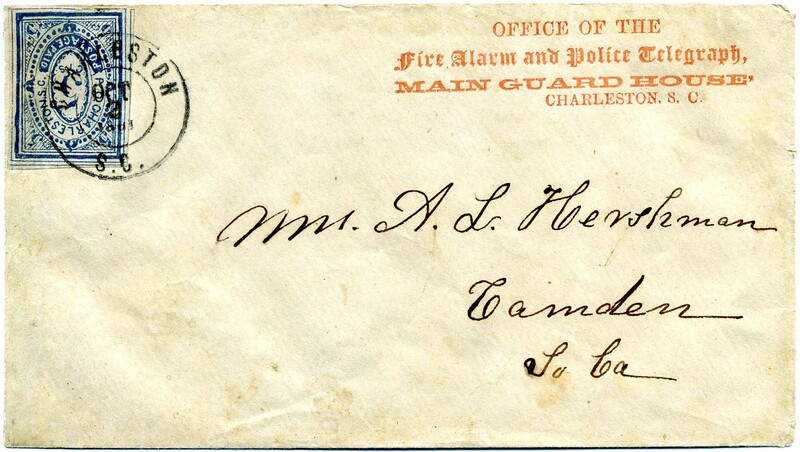 One of the two recorded "Fire Alarm and Police Telegraph" imprint covers with the Charleston postmaster's provisional, both from the same correspondence. Ex Calhoun. $6,500. The Fire Alarm and Police Telegraph system history is recounted in detail on the linked page. 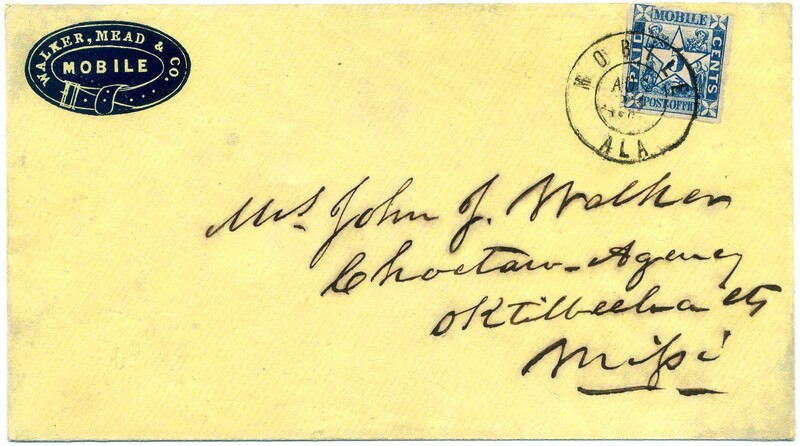 Macon, Ga., 5¢ light blue green, comma after “Office” variety #53X1, 4 large to huge margins all around (small scuff and tiniest sealed tear) tied by light Macon Oct 2, 1861, double circle datestamp on BLUE HARDWARE CORNER CARD of N. Weed, Macon, Ga. Only one other recorded such ad cover design and it bears a pair of CSA 7 and the cover has the left side added. 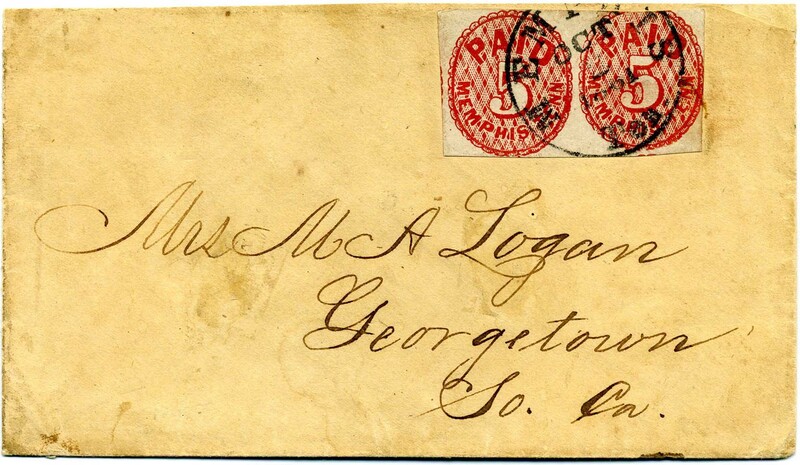 This is addressed to George S. Rives, Sparta, Ga., in bold script; cover lightly cleaned. 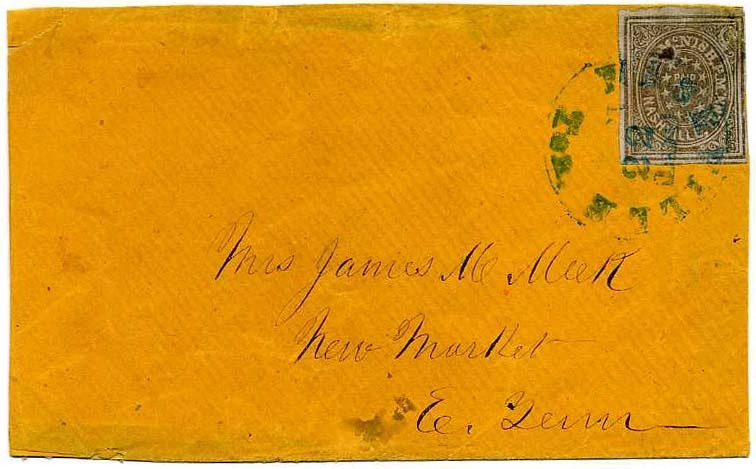 The Macon provisional with “Post Office, Macon, Ga.” added to the setting is very rare on cover (Peter W. W. Powell reported 24 on cover in The Confederate Philatelist, Sep.-Oct. 2000). Only three advertising covers were known with this stamp prior to this find, in addition to four or five printed college covers. This is the only the second recorded example of the Comma After “Office” variety on an advertising cover. A similar blue “lock” hardware cover with a Macon provisional sold for $37,375 in the 2009 Rumsey sale of the Ballard collection. A SPECTACULAR RARITY! $22,000. 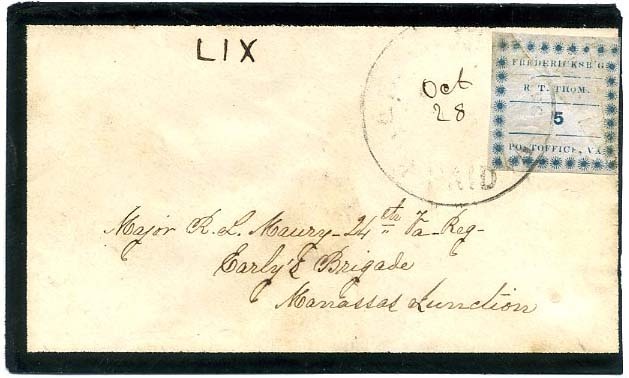 Mobile, Ala., 5¢ blue #58X2 tied neat town double circle datestamp Aug. 23, 1861, on ad cover with blue cameo of Walker, Mead & Co./Mobile in shape of belt, addressed to Mrs. John J. Walker, Choctaw Agency, Oktilbeeka Cty, Miss., 2002 CSA certificate and 2016 PF certificate noting back flap repair but neither the fact that it is also professionally cleaned and address ink reinforced. Ex Haub. SCV $6,000 for stamp on cover without ad corner card. $2,500. Memphis, Tenn., 5¢ red #56X2 with large margins, slightly cut in, minor margin stain, tied by Memphis, Ten., cds on cover to Miss Lou Scott, Care of Capt. [C.C.] Scott, Camden, Ark., with Camden /Ark. / Jul / 15 cds with manuscript "Forwarded, Due 5cts", back flap with ms “Mrs. Martha A. Jones, Memphis Care of Shelton Jones, Tenn,” and sent back to Memphis, slightly reduced at left, Choice, Ex Matz and Littlejohn with Weill and Jakubek backstamps $3,000. Captain Christopher C. Scott served in the Camden Knights and was known to his comrades and to Southern historians as "the hero of Hatchie Bridge." Much more detailed information on linked page. 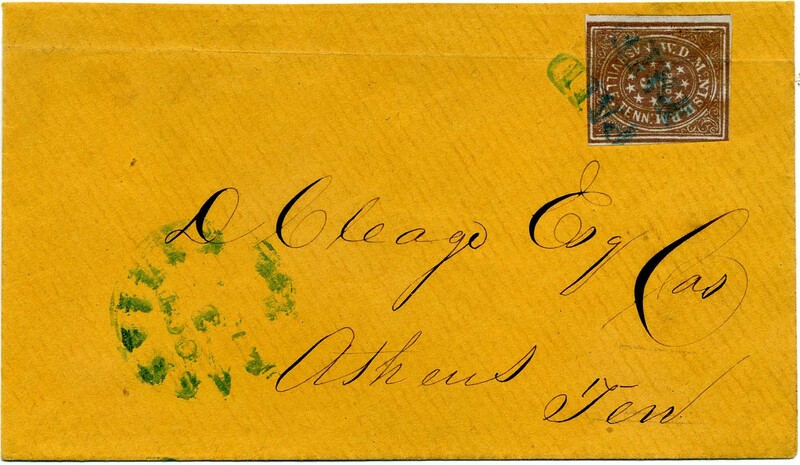 Athens, Ga 5¢ purple #5X1a tête-bêche foot to foot vertical pair used on expertly restored cover, faint cancel visible pair with circular date stamp at left, addressed to “Capt. George Hillyer, 9th Regmt Georgia Vol, Manassas, Virginia” by his father, Judge Junius Hillyer. 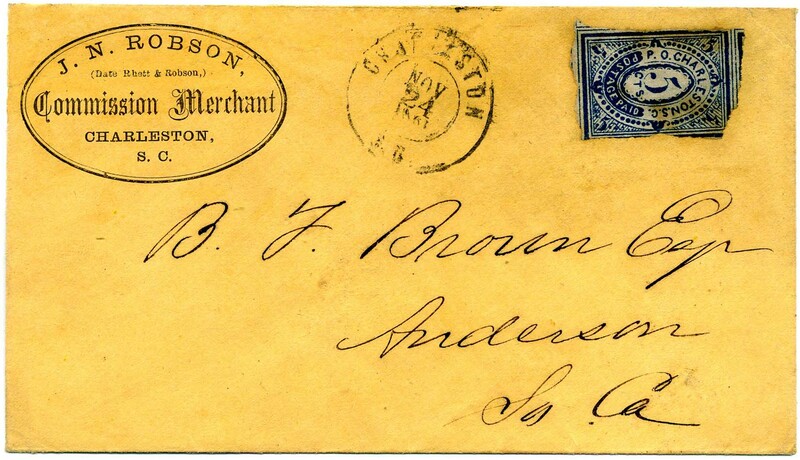 The Athens provisional stamps were issued during postmaster Thomas Crawford’s term and bear his name. They were printed on white wove paper from a form consisting of two similar but distinctly different woodcut designs. This results in all pairs showing both types. The pair was created by the work-and-turn printing method, as opposed to an inverted cliché among subjects on the plate. All are extremely rare. ONLY FOUR TÊTE-BÊCHE PAIRS ON COVER are RECORDED. This fourth one surfaced in late 2012. Provenance is from an old-time Atlanta collection; the purchase receipt for this cover from that collector was 1959, hence it was “off the grid” during the period when serious record keeping was taking place. Other Hillyer covers, some with letters, were also part of this recently discovered material including a patriotic from the Hillyer Rifles. 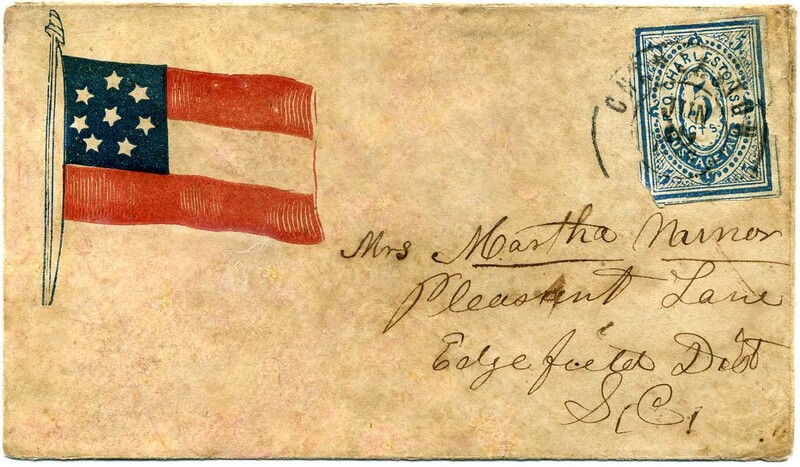 This cover was featured in The Confederate Philatelist, July-Sept 2013 2013 CSA certificate. THIS IS THE EARLIEST RECORDED USE ON COVER. Only four post offices are known to have produced tête-bêche pairs. SCV $20,000. $10,000. Capt. George Hillyer served as a Captain and fourth regimental commander of Company C, 9th Georgia Infantry Regiment, Longstreet’s I Corps, Hood’s Division, Army of Northern Virginia. Much more detailed information on linked page. Nashville, Tenn., 5¢ Carmine #61X2, vertical pair -- top stamp Position 1 (break in lower right frame line and white flaw in I of "McNish") above Position 4 (ornament at lower left extends into inner frame line) -- large to huge margins except just touched at bottom left frame line, gorgeous rich color in true carmine shade, tied by blue NASHVILLE / TEN // AUG / 5 / 1861 cds on cover to John H. Webb, Tally Ho P.O., Granville County, North Carolina, bottom stamp light crease at lower left, top stamp small tear at upper right. Approximately TWELVE PAIRS OF THE 5¢ NASHVILLE PROVISIONAL ARE KNOWN ON COVER, including all shade varieties and in all grades of condition. THIS PAIR IS ONE OF THE FINEST ON-COVER MULTIPLES of the carmine (two or three known) and ranks among the top three pairs for any of the Scott-listed colors. Stellar provenance of Ex Brooks, Emerson, Dr. Ludwig Simon, the D.K. Collection and signed Stanley B. Ashbrook. 2012 P.F. certificate, SCV $6,000. $5,000. 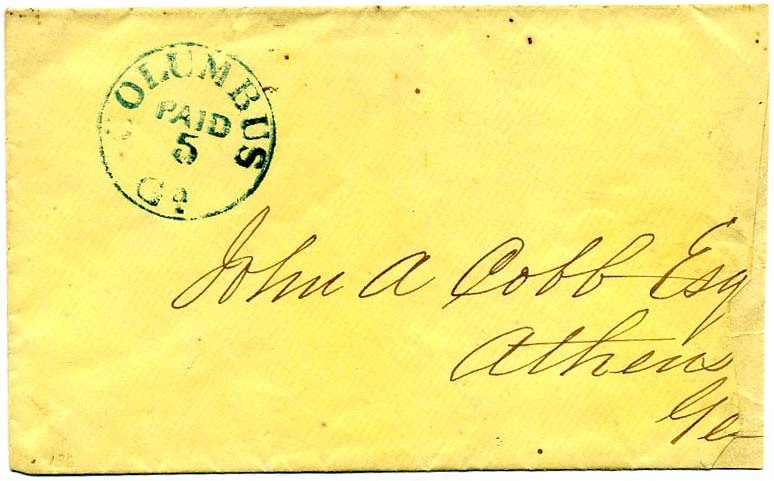 Uniontown, Ala., 5¢ green on gray blue #86X3, position 3, even margins mostly clear of ornaments all around, excellent impression on deeply blued paper, tied by Uniontown, Ala. circular datestamp on blue laid-paper cover to Mrs. R. A. Cobbs, care of Rev. 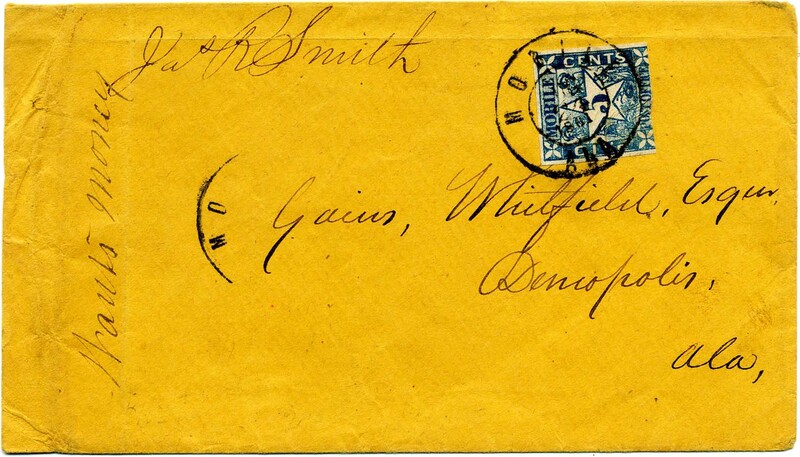 J. M. Mitchell, Montgomery, Ala. ONLY 13 ON-COVER EXAMPLES OF THE UNIONTOWN POSTMASTER’S 5-CENT PROVISIONAL ON GRAY BLUE PAPER ARE RECORDED in CROWN CENSUS. Ex Caspary, Hart, Telep, Dr. Maffeo and Sharrer. 1990 P.F. certificate. SCV $15,000. $12,000. 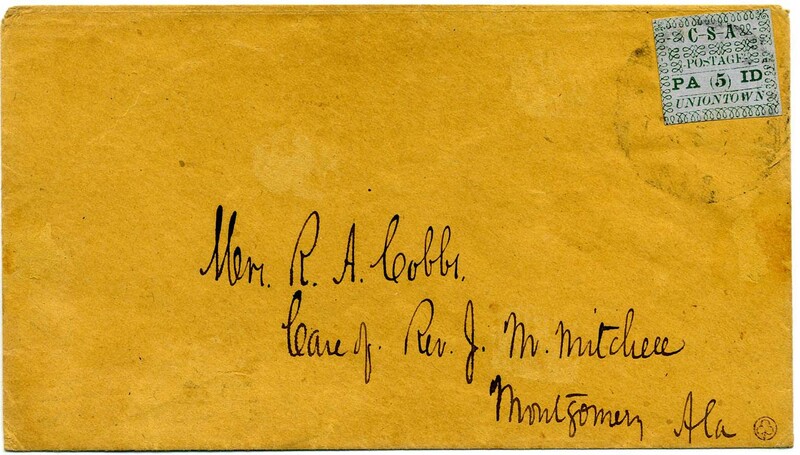 The Cobbs correspondence was found by R. S. Nelson of Birmingham, Alabama. Per reports at the time of the discovery, Mrs. Cobbs had been ill in a Montgomery hospital, and her husband wrote to her from Uniontown “daily, and sometimes twice a day, for some three weeks.” (Crown, p. 344). Uniontown, Ala., 5¢ green on gray blue #86X3, position 2, the only one of four positions with lobe ornaments at top and loop ornaments at bottom, tied by usual light strike of Uniontown cds on cover to Mrs. R. A. Cobbs, care of Rev. 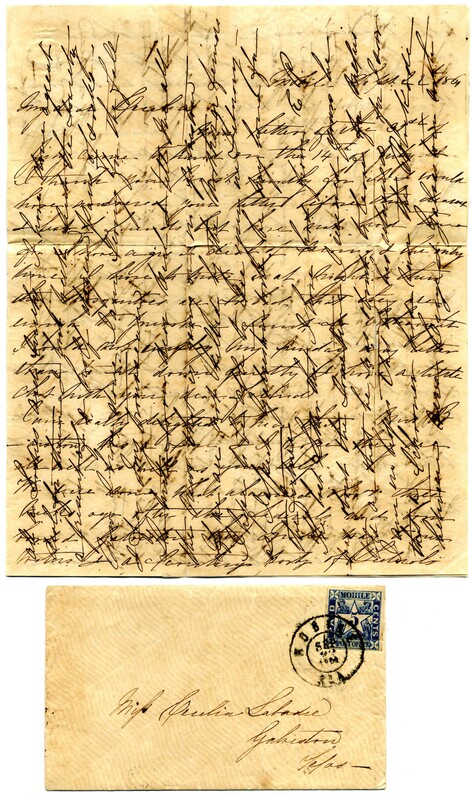 J. M. Mitchell, Montgomery, Ala. ONLY 13 ON-COVER EXAMPLES OF THE UNIONTOWN POSTMASTER’S 5-CENT PROVISIONAL ON GRAY BLUE PAPER ARE RECORDED in CROWN CENSUS. Although Scott does not distinguish between types, the distinctive typography of position 2 should qualify it as a major variety of Uniontown provisionals. Ex Ferrary, Hind, Hall, Gross, Felton and Warren with the distinctive purple Ferrary circled trefoil handstamp at bottom right. SCV $15,000. $12,000. Atlanta Ga., 5¢ black provisional entire #6XU2 with bold strike of provisional handstamp and Atlanta Ga. Jul. 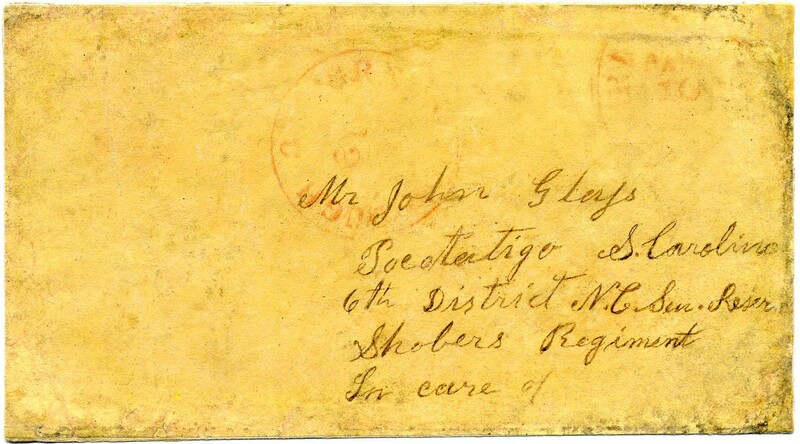 24, 1861, cds struck partly off edge of cover to Mes.s Taylor & Kirby, Attys at Law, S---ville, Georgia, on letterpress printed corner card of J. H. Lovejoy Wholesale Dealer in Groceries, Liquors, Cigars & Tobacco, Jul. 23 datelined original contents, slightly reduced at left into chain link border of corner card, Fine and rare, only six or seven Atlanta Provisional entires are recorded with corner cards. SCV $1,000 for just the provisional use, disregarding the corner card use. $700. Raleigh, N.C., 5¢ red entire #68XU1, clear strike of provisional handstamp with blue Raleigh N.C. Ju? 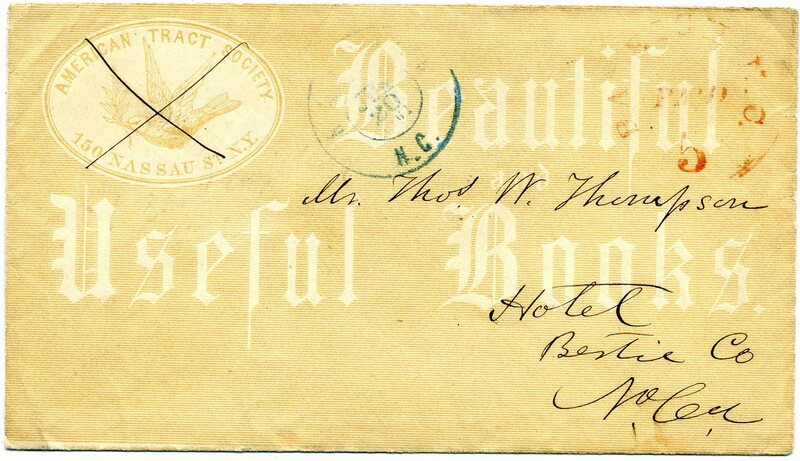 20, 1861, double-circle datestamp on light orange all-over lithographed American Tract Society advertising cover with a New York Nassau Street address, illustration of a dove (contemporaneously crossed out) and “Beautiful Useful Books” inscription, to Thos. W. Thompson, Hotel, N.C.; Very Fine and scarce use, "R.H.W. Co." (Raymond H. Weill) backstamp. Lovely! Ex Oswald. $900. Athens Ga., 5¢ purple #5X1 horizontal pair, left stamp type I, right stamp type II, full to large margins except right stamp just touched at top, tied by grids with Athens Ga. 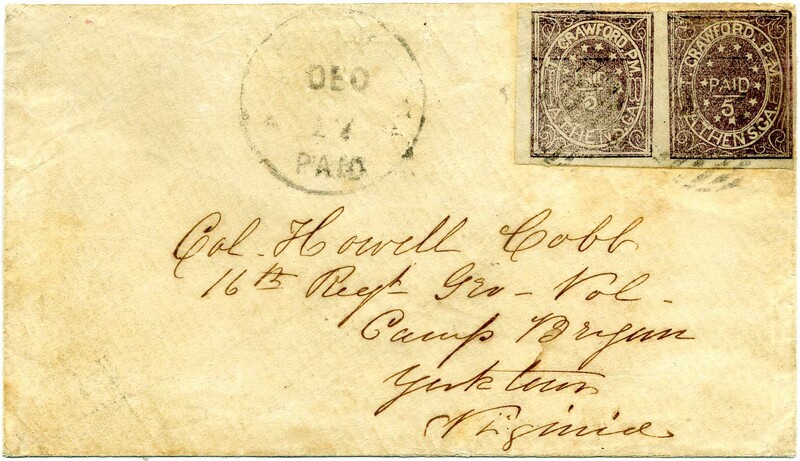 Paid Dec. 17 cds on cover to Col. Howell Cobb, 16th Regt Geo Vol, Camp Bryan, Yorktown, Va. Small skillful repair at right center of right stamp but it is all but impossible to detect and is not mentioned on accompanying 1997 CSA certificate which does mention the replaced back flap. The Athens provisionals, issued by Postmaster Crawford, were printed from two woodcut typographic engravings. An impression from the plate normally shows the small "Paid" (Type I) at left and the large "Paid" (Type II) at right. Ex Judd. SCV $7,500. $3,250. 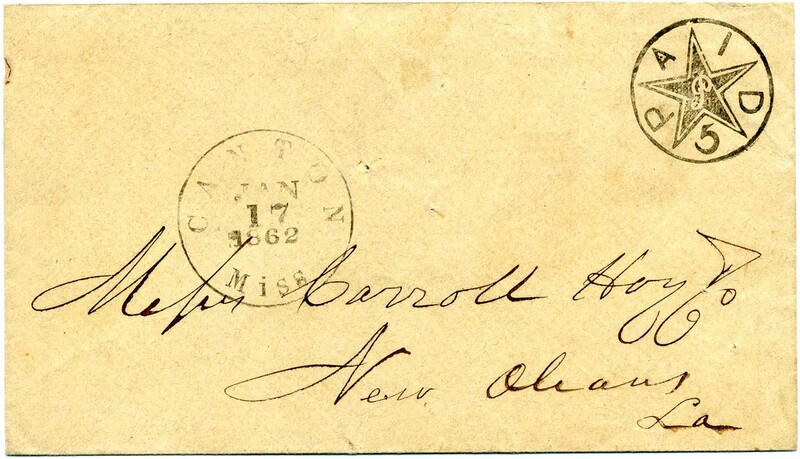 Canton Miss., 5¢ black provisional entire #14XU1 with bold strike of PAID / 5 / P Star in Circle provisional handstamp, Canton, Miss., Nov. 30, 1861, cds on cover to Carroll, Hoy & Co., New Orleans, usual filing pinholes, Very Fine with a darker strike than many, the "P" in center of the star is the initial of Postmaster William Priestly, 1997 CSA certificate. SCV $4,000. $1,500. Macon Ga., 5¢ black on light blue green wove, Comma after Office #53X1, large margins to just into outer frame line at right, tied by Macon Ga. ? 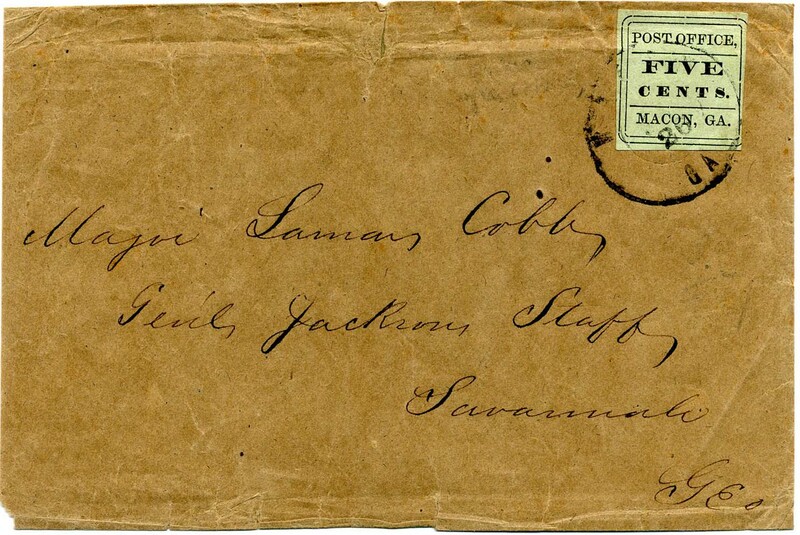 26, double-circle datestamp on homemade cover to Major Lamar Cobb, Gen’l Jackson’s Staff, Savannah Ga., slightly reduced at left, cover wrinkling and small tear at top. 1979 C.S.A. certificate. Other genealogical information accompanies. SCV $6,000. $3,000. 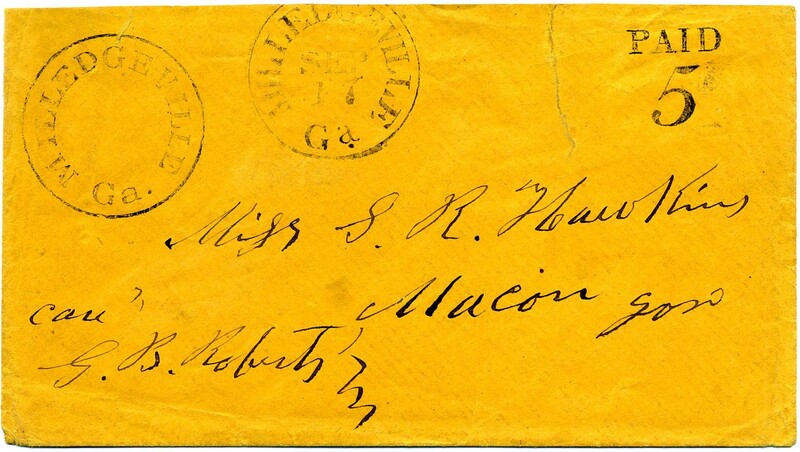 The Macon provisional with “Post Office, Macon, Ga.” added to the setting is very rare on cover (Peter W. W. Powell reported 24 on cover in the Confederate Philatelist, Sep.-Oct. 2000). Overall, the Comma after "Office" variety is approximately twice as rare as the period variety (counting on-cover and off-cover examples). Much more detailed information on linked page. Memphis, Tenn., 5¢ red #56X2, with huge top margin including significant portion of adjoining stamp, other sides full to just in at bottom, tied by partly clear strike of Memphis cds on darling small cover to Miss Anna J. Goddard, Camden Ark., Dec. 4, 1861, docketing, stamp with light pre-use crease, Very Fine, ex Brandon. SCV $2,000. $1,200. Nashville, Tenn., 5¢ violet brown #61X5 with full margins to barely touched, beautiful deep shade on blued paper, tied by one of two strikes of PAID straightline, Nashville, Ten., Oct. 3, 1861, cds on fresh cover to D. Cleage, Athens Ga., light horizontal crease across top of cover barely affects stamp, still Very Fine, ex Felton, with 1988 CSA certificate. SCV $4,250. $2,600. 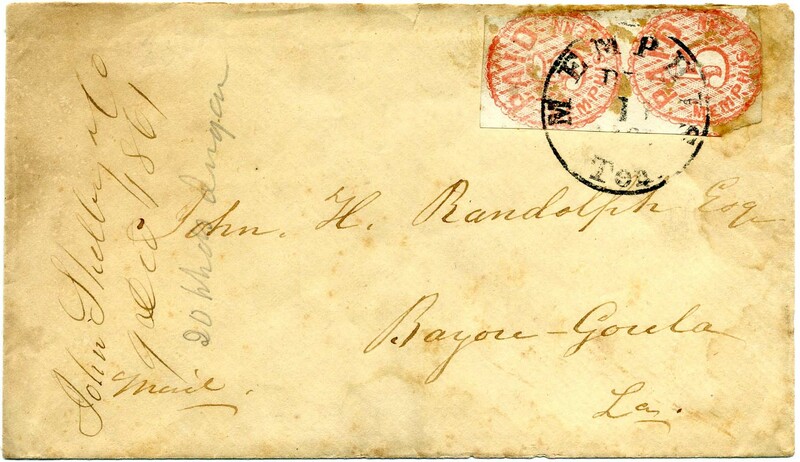 Memphis, Tenn., 5¢ red vertical pair #56X2 with gum stains, tied bold Dec 11  town cancel on lightly stained cover to John H. Randolph, Esq, Bayou Goula, La, from John Shelby & Co. Ex Matz & Katz. $900. John Hampden Randolph (1813-1883) was a Louisiana planter. During the Civil War he and a partner took their slaves and valuables to Washington County, Texas. Much more detailed information on linked page. 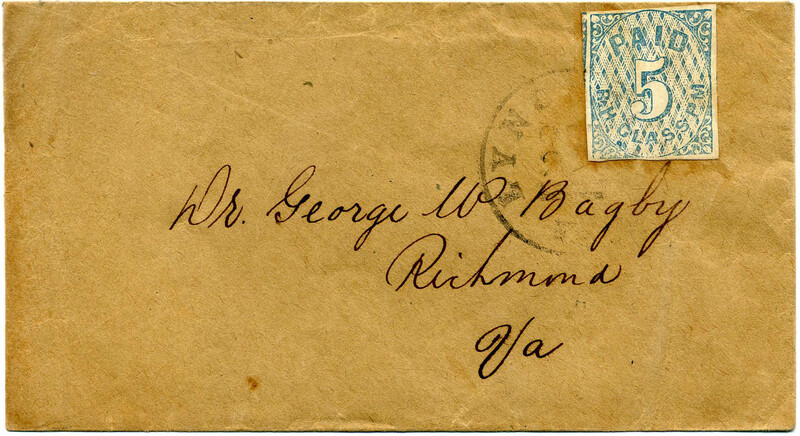 Lynchburg, Va., 5¢ blue #52X1, mostly large margins, including small portion of adjoining stamp at upper left, tied by town postmark on neat cover to Dr. George W. Bagby, Richmond, Va. One nicest of the fewer than 30 Lynchburg provisional stamps known on cover. Very Fine. Of the 25 single Lynchburg provisional stamps recorded on cover in the Calhoun census, about one-third have stamps with four full margins, while the majority are cut into on one side. The few known pairs demonstrate the extremely narrow spacing between stamps. Ex Sam Williams. SCV $6,500. $5,000. George William Bagby was a physician, editor, journalist, essayist, and humorist. Much more detailed information on linked page. 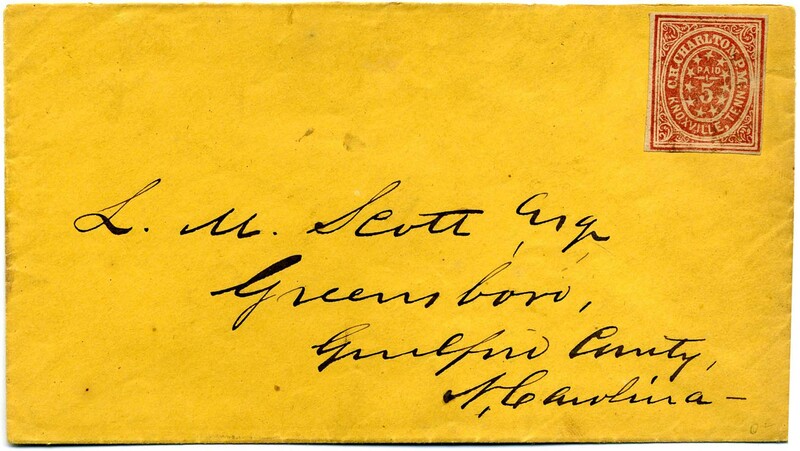 Savannah, Ga., 10¢ black #101XU4 on legal size cover with Savannah postmaster’s provisional handstamp and control marking that were crossed out in pen, franked with 5¢ green, Stone 1-2 (two singles), tied by light strike of TUDOR HALL / VA. // FEB / 7 / 1862 cds to Hon. 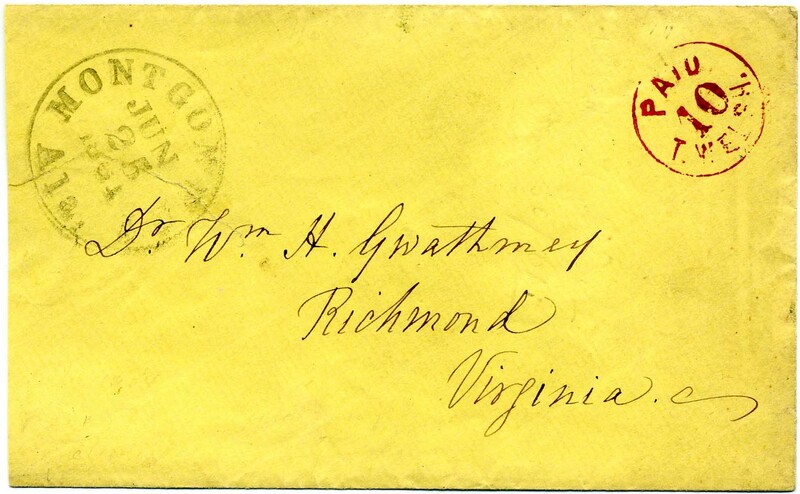 Alexander Stephens, Richmond Va. (CSA Vice President); missing top flap as is usual for this correspondence, small edge tears and nicks, open 3 sides, vertical file fold away from stamps. Usual contents docketing on back flap “Capt. W. W. Paine, Manassas, Va., Jan. 31, 1862. Encloses order relieving Capt. DeLaigle from duty with the 1st Regt. 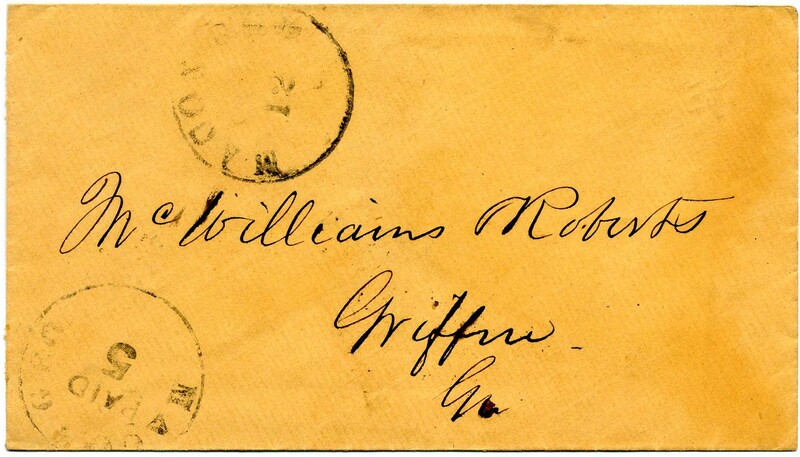 Ga. Regs.” EXTREMELY RARE USE SHOWING THE PREVIOUSLY PREPARED PROVISIONAL SUPERSEDED BY REGULAR POSTAGE. Ex Fisher. $750. Louis DeLaigle was Major and Quartermaster 1st Regiment Georgia Regulars, 6th Brigade, 2nd Corps, Army of the Potomac. Shown in Military District of Savannah equipping regiment, also Tybee Island, Ga. 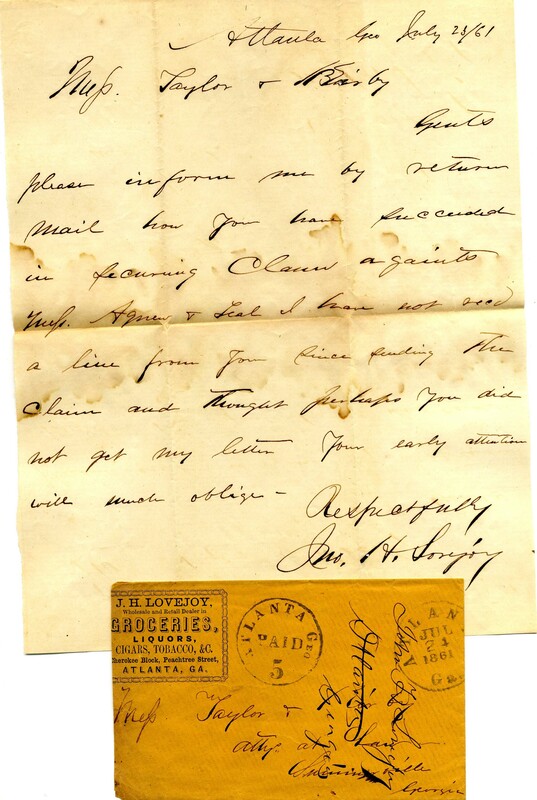 Numerous requisitions under his signature are found in Pickett Papers. Much more detailed information on linked page. 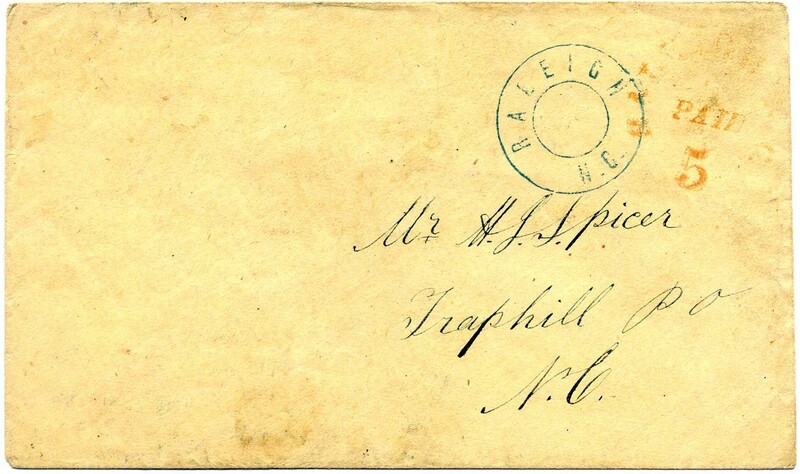 Raleigh, N.C., 5¢ Red entire #68XU1, usual part strike of provisional handstamp, clear blue RALEIGH / N.C. dateless double-circle handstamp on cover to H[enry] J[ohnson] Spicer, Traphill, N.C., Fine, Traphill was a haven for Union sympathizers during the war. SCV $400. $200. 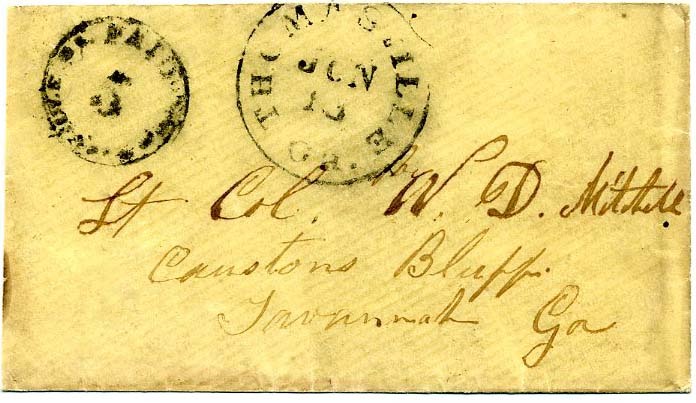 Thomasville, Ga. 5¢ black handstamped provisional entire #82XU2 (CV $900) with June 13  town postmark, addressed to Lt. Col. W. D. Mitchell, Cranston’s Bluff, Savannah, Ga. Slightly reduced at left and back opening tears. $600. William Dickey Mitchell served in Co. G, 29th Infantry (originally in the Savannah area then joined the Army of Tennessee) Much more detailed information on linked page. 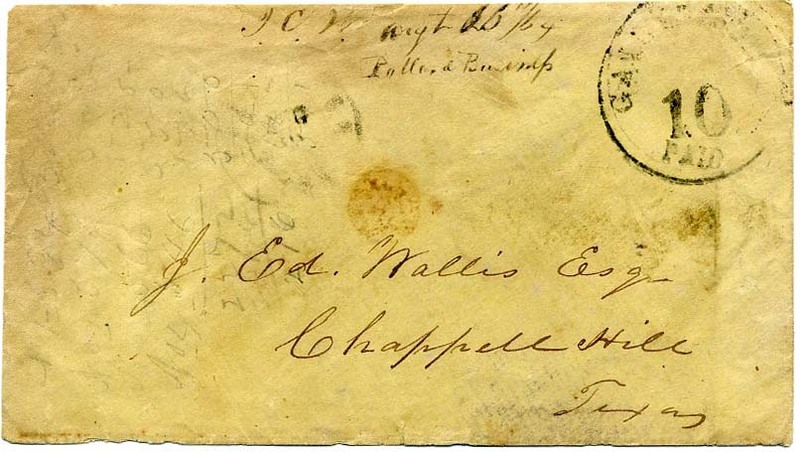 Thomasville, Ga, 5¢ black provisional entire #82XU2, with matching Oct 26 , addressed to Capt. 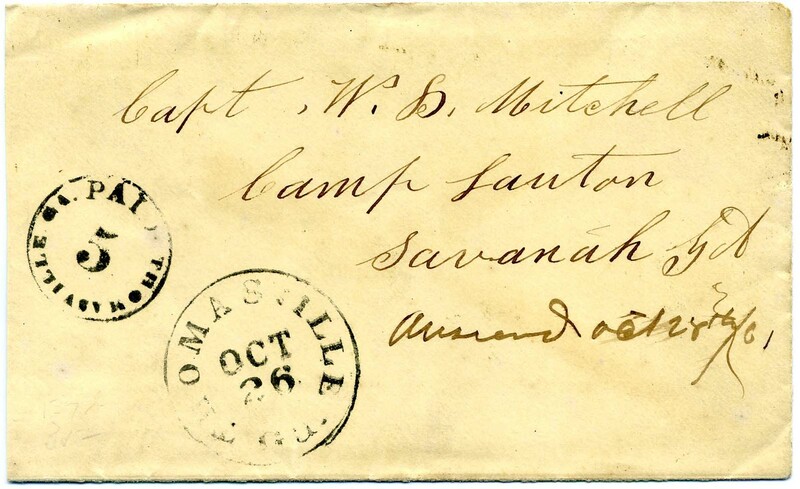 W. D. Mitchell, Camp Lawton, Savannah, Ga; slightly reduced at left. ONLY 37 RECORDED in Crown surveys. SCV $1,000. $1,000. 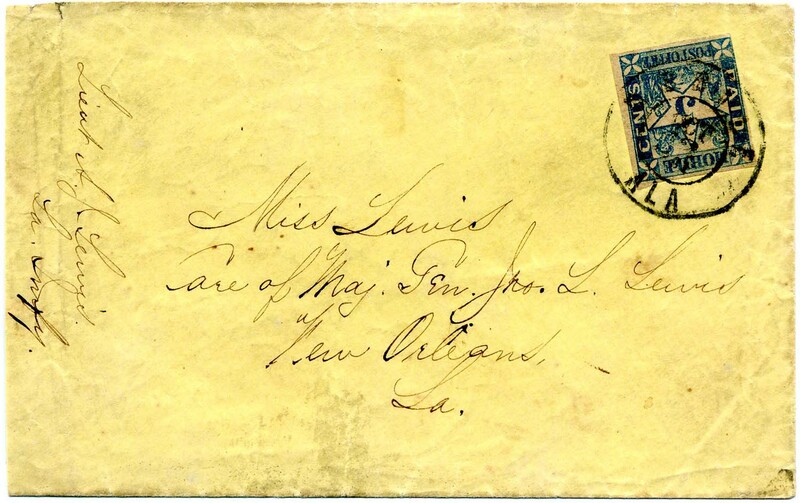 New Orleans, La., 2¢ blue #62X1 tied by neat 31 AUG town cancel on unsealed envelope addressed to “R.T. Bailey, Esq, Acona, Holmes Co[unty]., Miss”, bit of one side flap missing, Very Fine Showpiece. 2006 PF certificate, Ex Littlejohn and Cipolla, signed Frajola. SCV $5,000. $4,000.